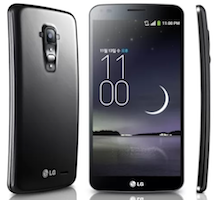 After launching its latest flagship smartphone called LG G2 last month, LG Electronics has now unveiled the G Flex phablet. The device further expands LG's premium G series, and is the first phablet from the company to sport a curved display. The phablet also sports new user experience (UX) features that take advantage of the curved form factor. Here is a look at the specifications of the device. The smartphone has a 6-inch HD curved P-OLED capacitive touchscreen display (1280Ã—720 pixels resolution), and runs on the latest Android 4.2.2 (Jelly Bean) operating system. It is powered by a 2.26 GHz quad-core Qualcomm Snapdragon 800 processor and has 2GB of RAM. The internal memory of the device is 32GB, but further memory expansion is not available. Flex has an 13 mega pixel autofocus rear camera with LED Flash that can record full high definition videos (1080p) at 60 frames per second and a 2.1 MP front-facing camera for video calls that can also record full HD videos at 30 fps. On the connectivity front, the device has Bluetooth 4.0, Wi-Fi (with Wi-Fi Direct), Near Field Communication, 3G and 4G (depending on the region). It also comes with a micro USB port but has no microSD card slot. The device has a 3,500 mAh battery and comes with GPS (with A-GPS support). The device will be available in Korea starting November 2013, availability in additional markets will be announced thereafter. Details on India pricing and availability is not available as of now. Earlier this month, Samsung had taken the wraps of the world's first curved phablet, christened Galaxy Round. The device is in many ways similar to the recently launched Galaxy Note 3, except for its curved display and the exclusion of the S-Pen. To leverage the curved screen, the company has also added a number of features to the device, read here to know more.